Phosphenes are transient percepts of light that can be induced by applying Transcranial Magnetic Stimulation (TMS) to visually sensitive regions of cortex. We demonstrate a standard protocol for determining the phosphene threshold value and introduce a novel method for quantifying and analyzing perceived phosphenes. Elkin-Frankston, S., Fried, P. J., Pascual-Leone, A., Rushmore III, R. J., Valero-Cabré, A. A Novel Approach for Documenting Phosphenes Induced by Transcranial Magnetic Stimulation. J. Vis. Exp. (38), e1762, doi:10.3791/1762 (2010). Stimulation of the human visual cortex produces a transient perception of light, known as a phosphene. Phosphenes are induced by invasive electrical stimulation of the occipital cortex, but also by non-invasive Transcranial Magnetic Stimulation (TMS)1 of the same cortical regions. The intensity at which a phosphene is induced (phosphene threshold) is a well established measure of visual cortical excitability and is used to study cortico-cortical interactions, functional organization 2, susceptibility to pathology 3,4 and visual processing 5-7. Phosphenes are typically defined by three characteristics: they are observed in the visual hemifield contralateral to stimulation; they are induced when the subject s eyes are open or closed, and their spatial location changes with the direction of gaze 2. Various methods have been used to document phosphenes, but a standardized methodology is lacking. We demonstrate a reliable procedure to obtain phosphene threshold values and introduce a novel system for the documentation and analysis of phosphenes. We developed the Laser Tracking and Painting system (LTaP), a low cost, easily built and operated system that records the location and size of perceived phosphenes in real-time. The LTaP system provides a stable and customizable environment for quantification and analysis of phosphenes. In a dimly lit room, seat the participant in a comfortable position. Have the participant put on a swim cap, provide them with hearing protection, and adjust the cap and ear plugs for comfort. To locate and mark the initial point of stimulation, first identify the inion, and then move ~2cm rostrally and ~2cm laterally (figure 1). Alternatively, a frameless stereotaxic system can be used to position the TMS coil over the targeted cortical region. 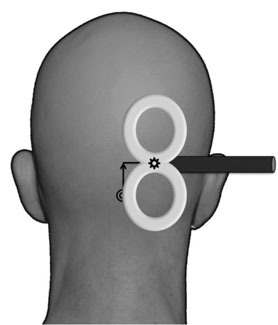 Using a standard figure-eight (double) TMS coil (70mm), place the center of the coil directly over the location determined in the previous step. 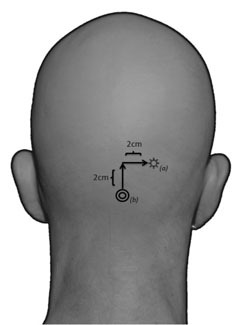 The coil should be held tangential to the surface of the scalp and oriented in a medial to lateral orientation with the handle facing away from the midline (figure 2). When the participant is ready, apply a single pulse at 60% intensity output. Ask the participant to describe any visual sensation they may have perceived. Participants who are naíve to phosphenes may benefit from wearing a blindfold. If no phosphene was reported, reposition the coil and redeliver a pulse. If the participant still does not report a phosphene, continue delivering pulses every 7 to 10 seconds (~ 0.1 Hz), increasing the intensity by 5% after every five attempts until 100% intensity is reached. When the participant reports a phosphene ask him or her to describe in detail what they perceived including color, shape and location. Note: Phosphenes should appear in the contralateral visual field to the hemisphere that is being stimulated. For example if TMS is applied over the right visual cortex, phosphenes should be perceived in the left visual field. When phosphenes are reliably reported, mark the location of the coil on the swim cap. Deliver a series of pulses at the same coil location and orientation as above. Ask the participant to confirm the presence of the induced phosphene. Deliver pulses every 7 to 10 seconds (~ 0.1 Hz). Instruct the participant to report, after each pulse, whether a phosphene was perceived using the following criteria: with a "yes" an unambiguously perceived phosphene; "no" the absence of any visual perception; "maybe" if they are not sure. A "maybe" response should not be counted as a positive response when determining the threshold value. Adjust the stimulation intensity, delivering 10 pulses at each intensity level, until a phosphene threshold is determined. The threshold is defined as the lowest intensity of stimulation at which the participant reports unambiguous phosphenes for at least fifty-percent of delivered pulses. Seat the participant so that the nasion (area between the eyes) is approximately 30cm from the center of the projection screen. To acclimate the participant to the LTaP system, give them the laser pointer and instruct them to practice tracing figures that resemble perceived phosphenes. If the participant needs more practice, you may ask the participant to direct the laser point to indicated locations on the projection screen. When the participant is acquainted with the LTaP system and can accurately draw shapes on the screen, deliver a series of TMS pulses to the location marked in the previous steps sufficient to induce a visible phosphene. Ask the participant to trace or outline the perceived phosphene on the projection screen using the laser pointer. In the three test conditions the stimulus intensity should be 120% of the determined threshold value. For example, if the determined threshold value is 65%, the stimulus intensity value should be set to 78%. The coil location and orientation are the same as determined and described in the above steps. In the first of the three test conditions, have the participant direct their gaze towards a central fixation point. After delivering a pulse instruct the participant to trace or outline the perceived phosphene using the laser pointer. Deliver a series of pulses sufficient to induce ten phosphenes. In the second test condition, have the participant direct their gaze towards a fixation point that is elevated 45° from the central fixation point. Repeat the protocol as described for the first condition. In the third test condition, have the participant direct their gaze towards a fixation point that is positioned 45° to the right of the central fixation point. Repeat the protocol as described for the first condition. After the completion of the study data obtained from the LTaP system can be analyzed. The output of the LTAP system consists of an .xml file including color coded X-Y coordinates with timestamps for each record tracing. Analyze the data in order to detect the shift in phosphene position in reference to shift of gaze. When the TMS coil is placed over the right hemisphere all phosphenes should be observed in the left visual field. When participants are instructed to look straight ahead, phosphenes are typically located in the lower left visual field. Phosphenes should move in accordance with the shift in visual gaze (either 45° vertically or horizontally from central fixation) (figure 4). Figure 1. Locating and marking the initial stimulation site. For occipital visual areas, the initial stimulation site (a) is typically located ~ 2 cm dorsally and ~ 2 cm laterally from the inion (b). Figure 2. Position the coil for stimulation. The center of the coil is held tangential to the scalp at the site of stimulation. To minimize an unintended spread of stimulation, orient the handle of the coil away from the midline. Figure 3. The LTaP (Laser Tracking and Painting) system. 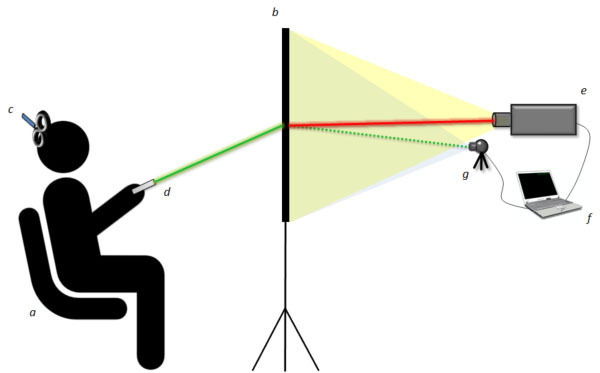 A participant (a) sits in front of a rear projection screen (b). After stimulation by the TMS coil (c), the participant uses a laser pointer (d) to draw the perceived phosphenes on the screen (d). A rear-facing webcam (e) records the laser and feeds it to a computer (f) running the LTaP software. The data is then projected back onto the screen via a rear-facing projector (g). Figure 4. Post-processing of the LTaP data. The location and size of the perceived phosphenes (white shapes) are shown relative to the location of fixation, indicated by the crosshairs. In this video, we have demonstrated a standard protocol for obtaining a phosphene threshold value and introduced a novel method for recording phosphene size and visual field location. Phosphenes were elicited by delivering individual pulses of TMS to the right occipital cortex adjacent to the occipital pole. Phosphene threshold values provide a valuable indication of relative cortical excitability; and have been used both as an outcome measure and as a means of determining the appropriate intensity of TMS in variety of studies of human visual perception8-12. Phosphenes induced by TMS provide an intrinsic and non-invasive measure for investigating the visual system. However, an inherent problem is in consistently recording and quantifying data. The LTaP system was developed to confront this challenge and provides a method for recording phosphenes as objective and quantifiable data. Using a webcam, LTaP registers the point on the projection screen produced by the laser. These points are translated into a series of X-Y coordinates that are recorded in real-time and simultaneously projected back onto the screen, providing the participant with instantaneous feedback. In a dimly lit room, participants were seated directly in front of a projection screen and instructed to trace the perceived phosphene onto the screen using a laser pointer. Multiple phosphenes were elicited while participants were instructed to maintain fixation in three distinct locations: the center of the screen, at 45° elevation from the central point, and 45° to the right of central fixation. In each case, results were consistent with the predicted location of the perceived phosphene. When TMS was applied over the right hemisphere all phosphenes were observed in the left visual field, consistent with the retinotopic organization of the visual system. Furthermore, as fixation changed, the location of recorded phosphenes was predictably displaced in the direction of gaze. When used in conjunction with other research methods the LTaP system can greatly enhance the utility of experimental designs that utilize phosphenes to probe the visual system. Several advantages are evident: the development of the system is cost-effective and easy to replicate; recording data over multiple trials in a single database reliably facilitates complex post-analysis that would otherwise prove difficult. Most importantly, participants are able to immediately and consistently record perceived phosphenes over a large field of view (~108°) without moving, and therefore changing their frame-of-reference, between trials. The ability to compare and analyze phosphenes across subjects and under various experimental conditions will increase our understanding of the brain and the visual system. Furthermore, while the LTaP system was developed to address a specific problem, its utility is far-reaching and applicable to other domains within neuroscience or other unrelated fields. How transcranial magnetic stimulation works. Lindsay M. Oberman, Beth israel Deaconess Medical Center [Internet]. The Boston Globe. Boston, MA. Available from: http://www.boston.com/interactive/graphics/200906_tms/ (2009). Kammer, T., Puls, K., Strasburger, H., Hill, N. J., Wichmann, F. A. Transcranial Magnetic Stimulation in the Visual System. I. the Psychophysics of Visual Suppression. Experimental Brain Research. 160, 118-128 (2005). Afra, J., Mascia, A., Gérard, P., Maertens de Noordhout, A., Schoenen, J. Interictal cortical excitability in migraine: a study using transcranial magnetic stimulation of motor and visual cortices. Ann. Neurol. 44, 209-215 (1998). Aurora, S. K., Ahmad, B. K., Welch, K. M., Bhardhwaj, P., Ramadan, N. M. Transcranial magnetic stimulation confirms hyperexcitability of occipital cortex in migraine. Neurology. 50, 1111-1114 (1998). Silvanto, J., Pascual-Leone, A. State-Dependency of Transcranial Magnetic Stimulation. Brain Topography. 21, 1-10 (2008). Silvanto, J., Muggleton, N., Cowey, A., Walsh, V. Neural adaptation reveals state-dependent effects of transcranial magnetic stimulation. European Journal of Neuroscience. 25, (2007). Kammer, T., Beck, S. Phosphene thresholds evoked by transcranial magnetic stimulation are insensitive to short-lasting variations in ambient light. Exp Brain Res. 145, 407-4010 (2002). Bjoertomt, O., Cowey, A., Walsh, V. Spatial neglect in near and far space investigated by repetitive transcranial magnetic stimulation. Brain. 125, 2012-2022 (2002). Gothe, J. Changes in visual cortex excitability in blind subjects as demonstrated by transcranial magnetic stimulation. Brain. 125, 479-490 (2002). Hotson, J. R., Anand, S. The selectivity and timing of motion processing in human temporo-parieto-occipital and occipital cortex: a transcranial magnetic stimulation study. Neuropsychologia. 37, 169-179 (1999). Kammer, T. Phosphenes and transient scotomas induced by magnetic stimulation of the occipital lobe: their topographic relationship. Neuropsychologia. 37, 191-198 (1998). Stewart, L., Ellison, A., Walsh, V., Cowey, A. The role of transcranial magnetic stimulation (TMS) in studies of vision, attention and cognition. Acta Psychol (Amst). 107-275 (2001).